‘Holding ground where the wood lands’ is an two-channel film installation. Set in Portmarnock, Co Dublin where the artist grew up surrounded by open fields which were once part of a vast estate owned by the Plunkett family. Despite encroaching suburbia, it maintained a faded colonial atmosphere, a place where peacocks still roamed and ponds became overgrown. 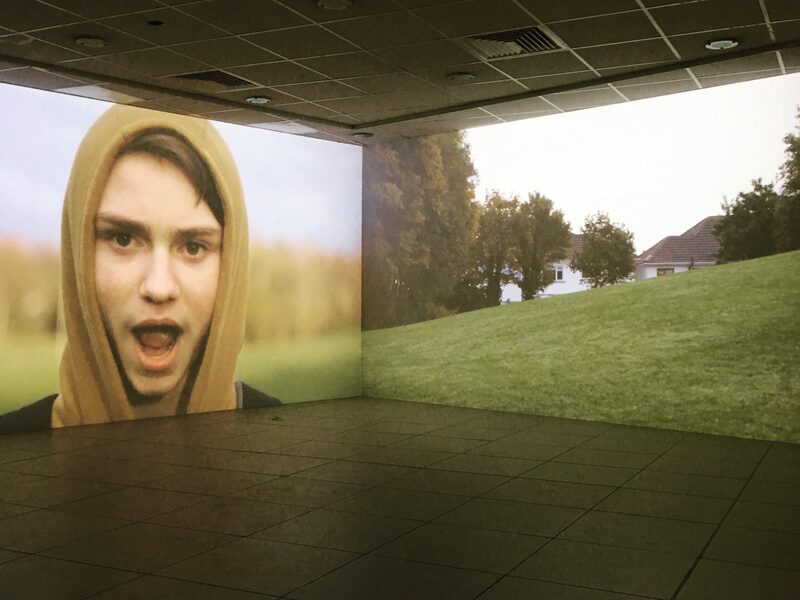 Revisiting this location using an ethnographic approach and collaborating with a group of young men from Dublin 15’s Foroige, the film captures them at a pivotal stage in their lives, as they begin to find their place in the world. Holding ground… conjoins documentary style filmmaking with the theatrical atmospherics of a staged read through, slipping in and out of what is naturalistic and real, to a sub layer where alternate narratives take hold and boundaries and meaning shift. Amharc Fhine Gall (Fingal Gaze) is an annual exhibition funded by Fingal County Council’s Arts Office, in collaboration with Draíocht. The exhibition was initiated in 2004 to provide a platform for visual artists from or living in Fingal.